I decided that I want this to be our cake topper. 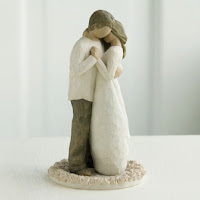 I don't even know what the cake is going to look like yet, but it's going to be designed around this Willow Tree cake topper because I love it. We went and had our first meeting with our pastor today to talk about our wedding and our marriage. We have to take an online survey and go back in February to go over our results with him and iron out the rest of the wedding specifics. This is the first time we've talked to him. Our original pastor who was going to do our wedding left our church and he took her place. He seems very nice though, I like him. I can't wait for our wedding, I think it's going to be great.